(JTA) — Jared Kushner once lent Benjamin Netanyahu his bed. That’s a juicy takeaway from Jodi Kantor’s deep dive into the first son-in-law and his relationship with Israel published over the weekend in The New York Times. 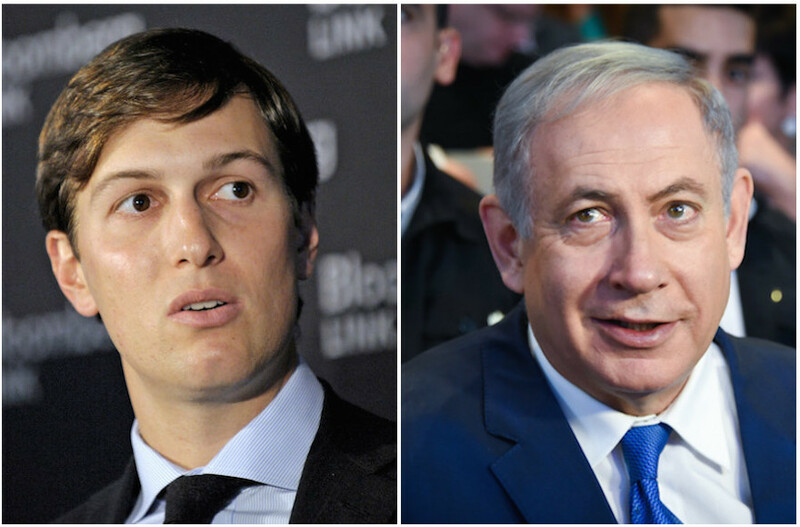 Netanyahu has long been a friend of the Kushners, and particularly Jared’s dad, Charles Kushner, a major donor to pro-Israel and Jewish causes. One time, Kantor reports – she doesn’t specify when – Jared gave up his bed and moved to the basement so Netanyahu could spend the night at their home in Livingston, New Jersey. Politico and The Washington Post also shared inside reporting about Kushner and his wife, Ivanka Trump, and the Times joined the Post in fleshing out the profile of Stephen Miller, President Donald Trump’s senior adviser and frequent opening act. Here are some other surprising facts from the coverage this weekend of the Jews in Trump’s inner circle. * A flagpole at the Joseph Kushner Hebrew Academy, named for Jared’s grandfather, is dedicated to the memory of Alisa Flatow, an alumna who was murdered by terrorists. Jared Kushner attended the school – then named the Hebrew Youth Academy in Livingston – with Alisa’s younger sister, Ilana. When Alisa, 20, was killed in 1995, in a bus bombing in the Gaza Strip, Jared and Ilana were eighth-grade classmates. The school “couldn’t fathom how a young man can load himself up with dynamite and blow himself up in a van and have his parents celebrating his death,” Stephen Flatow, the girl’s father, told the Times. * Jared stopped wearing his kippah when he attended Harvard. The Times reported that Kushner maintained other Orthodox observances at the university – JTA has reported his closeness to the university’s Chabad House – but the head-covering was gone. * Jared’s dad still looms large in his life. As close as he is to Ivanka’s dad, Jared remains his own father’s son. Charles Kushner joined the meeting in September of Netanyahu, Trump and Jared Kushner, the Times reported. * In fact, all might not be so serene between Jared and Donald – or for that matter between Ivanka and Donald. Jared Kushner’s first diplomatic coup was to organize, with Foreign Minister Luis Videgaray of Mexico, a calming of the waters between the U.S. and its southern neighbor. On Jan. 25 – not a week into Trump’s term – Kushner, backed by Videgaray, persuaded the new president to tone down remarks he would give as he ordered a wall built along the U.S.-Mexico border, fulfilling a campaign promise, The Washington Post reported. The Mexicans liked what they heard – “a strong and healthy economy in Mexico is very good for the United States,” Trump said. Mexican President Enrique Peña Nieto was set to come to Washington, a visit that would have upended notions that Trump’s election had set relations between the neighbors on a downward spiral. All was right with the world. For at least an afternoon or so, that is. Later the same day, Peña Nieto reiterated that Mexico would not pay for the wall, prompting Trump to angrily post on Twitter the next morning that the summit should be canceled. “Kushner seethed with frustration at the outcome,” the Post reported, although it did not say whom he principally blamed: the Mexican president for bringing up payment for the wall or his father-in-law for not heeding his advice. * Speaking of not heeding advice: Ivanka Trump, according to Politico, rebuked White House counsel Kellyanne Conway for using Ivanka’s eponymous fashion line as political fodder when she urged Americans last week to buy Ivanka now that Nordstrom dropped the line. That set off an ethics controversy, and not just in the media, but within the family as well, Politico reported, suggesting that Conway was acting on Donald Trump’s orders and that Ivanka was unhappy, both with Conway and with her dad. * Jared Kushner has bonded with two ambassadors: Ron Dermer of Israel, according to the Times, and Yousef Al Otaiba of the United Arab Emirates, according to the Times and another profile in Politico. “He is in almost constant phone and email contact with Otaiba, whom he met last June on the campaign through a mutual friend, the billionaire real estate investor Tom Barrack, one of Trump’s closest friends and the chair of his inaugural committee,” Politico reported. Trump has tasked Kushner with brokering a Middle East deal, and his friendship with Oitaba jibes with Netanyahu’s agenda of making peace from the “outside in” — i.e., forging ties first with Sunni Arab states, growing closer to Israel because of a shared apprehension of Iran. Kushner also secretly talked Israel with Haim Saban during the campaign, Politico reported. Kushner has long admired the Israeli-American entertainment mogul and backer of all things Hillary Clinton. It’s not clear why Kushner was reaching out to Saban — it didn’t diminish Saban’s support for Trump’s rival. Kushner has also met with Henry Kissinger, who as secretary of state in the 1970s laid the groundwork for Israel-Egypt peace. Kissinger left the meeting with little clarity about Kushner’s actual role. — Stephen Miller, a senior adviser to and speechwriter for Trump (and his opening speaker at campaign rallies) earned two major profiles, in the Times and The Washington Post. Arch-conservative David Horowitz launched Miller’s career by introducing him to then-Sen. Jeff Sessions, R-Ala., who was the first senator to endorse Trump and now is the U.S. attorney general. Miller also blitzed this weekend’s Sunday shows, and it wasn’t so pretty. His performance, avoiding questions about whether Trump was ready to sack his national security adviser, Michael Flynn, for being less than truthful about a conversation he had in December with Russia’s ambassador, was widely derided by various fact-checking sites. Stephanopolous blasted Miller for backing up Trump’s claim that he lost New Hampshire because of fraudulent voting. Miller kept making assertions of fraud without presenting evidence (“widely known,” “very real” were his terms of art). “Just for the record, you have provided absolutely no evidence,” Stephanopoulos said. Miller also seemed to have problems with constitutional notions of speech protections and co-equal branches of government. Referring to court rulings staying his boss’ ban on the entry of refugees or of travelers from Muslim-majority nations, he seemed to argue that Trump’s authority – at least in this area — was unchallengeable in every forum. One area where Miller cast a little clarity: his association with Richard Spencer, the white separatist, when they were both at Duke University. The coupling was always odd: Miller is Jewish, Spencer believes in a white Christian ethno-state that excludes Jews (although he is happy to deal with Jews living in a state of their own). Miller, when first asked in October by Mother Jones about their days at Duke, would only say he had “absolutely no association” with Spencer. In The Washington Post profile, Miller for the first time owned up to an association that was minimal – but that also comports what was previously reported: Miller and Spencer interacted as members of Duke’s Conservative Union, and once joined, in 2007, to organize an immigration debate. But Miller also said that was where it ended.